This section reviews common administration tasks for the Lync Server 2013 Monitoring role. In general, there isn’t much day-to-day administration of the Lync Server 2013 Monitoring components. Instead, this section focuses on the reports generated by the Monitoring Server. The most important page is the Dashboard. The Dashboard is broken up into four distinct areas or panes: System Usage, Per-User Call Diagnostics, Call Reliability Diagnostics, and Media Quality Diagnostics. By default, the Dashboard shows “this week” and a “6 week” view. However, a monthly view is also available via a link in the upper-right corner of the screen. 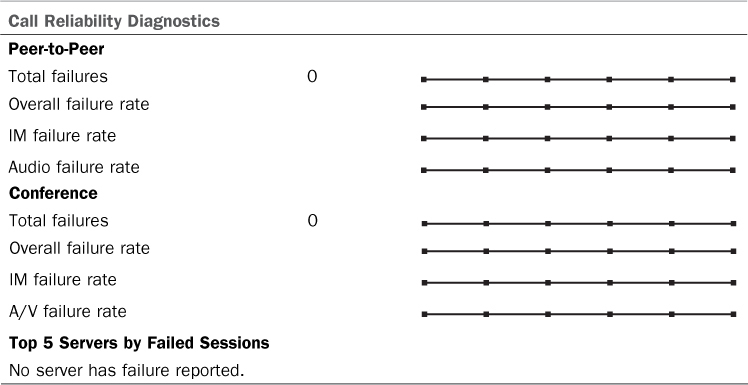 System Usage is the first section (see Table 1). Many of the fields are self-explanatory, and they are very useful for at-a-glance looks at the environment. For example, the total A/V Conference Minutes item is great for “back of the napkin” ROI on the savings Lync Server 2013 provides over outsourced conferencing services. Possibly even more important, it gives a snapshot of how your users are using Lync Server. Are they using Communicator as a softphone? How about for application sharing? Has overall collaboration time increased since Lync Server 2013 was implemented? This report isn’t the end-all for these answers but it does provide an insightful view. The next section is Per-User Call Diagnostics (see Table 2). This is a great at-a-glance view for overall health of your voice deployment. It also makes for great bragging rights in a well-planned deployment. The Call Reliability Diagnostics section (see Table 3) provides a deeper view into the health of your UC deployment and a window into the end-user experience. This is something new to Lync Server 2013 and is a very valuable resource to administrators. The last section is Media Quality Diagnostics (see Table 4). This table gives information about quality of calls in terms of total poor-quality calls and percentage of poor-quality calls compared to the total number of calls. It also offers the same metrics for conferences. From the main Monitoring Server reports page there are a plethora of reports to review. The next section summarizes each report in the order in which it is presented on the main page. Also, here is a full list of the available reports. You’ll see that they are a deeper dive into the snapshots presented in the Monitoring Server reporting Dashboard. • User Registration Report—This report shows user registrations over time. This can be useful to determine peak login times and AD authentication requirements. • Peer-to-Peer Activity Summary Report—This report shows peer-to-peer activity including IMs, application sharing, and file transfers. • Conference Summary Report—The Conference Summary Report measures conference metrics including Communicator conferences and PSTN conferences, number of organizers, and total conference minutes. • PSTN Conference Summary Report—This report contains data specific to PSTN Conferences in Lync Server. • Response Group Service Usage Report—Metrics for Response Groups including agent response and number of calls answered by the response group. • IP Phone Inventory Report—Statistics about the number and type of IP phones in the Lync Server deployment. Includes all Communicator Phone Edition devices. • User Activity Report—This report reviews user-focused call failures for person-to-person calls and conferences. 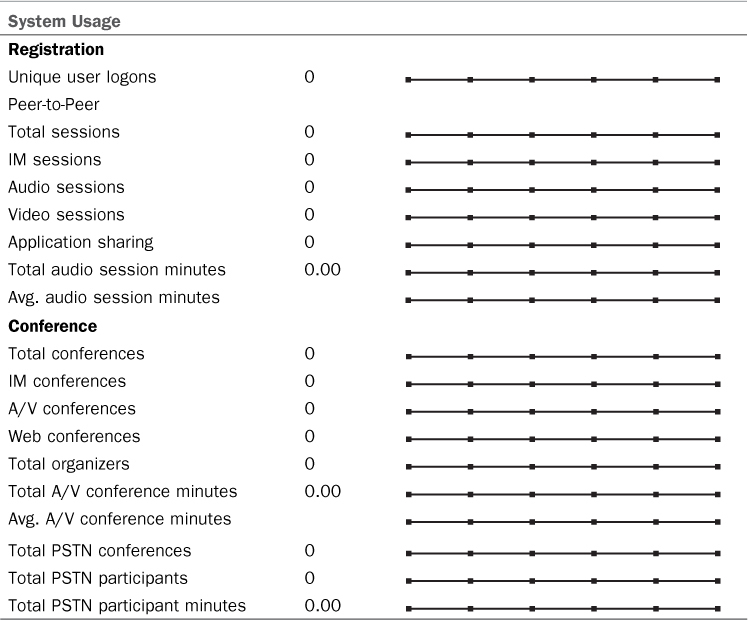 This report is useful for measuring the overall health of your conferencing deployment. • Call Reliability Summary Report—This gives a high-level view of failed calls, total call minutes, and other call metrics. • Peer-to-Peer Activity Reliability Report—This report contains information about failures in peer-to-peer activity including IMs and collaboration activity. • Conference Reliability Report—This reports on failures during IM, peer-to-peer, and PSTN conferences. • Top Failures Report—This report gives a snapshot view of the top failures in the organization. It can reveal systemic problems and configuration issues. • Failure Distribution Report—This report provides statistics about the failures related to site or pool. It is a great troubleshooting tool for finding error conditions. • Media Quality Summary Report—This report provides an overall high-level view of media quality across the whole environment. It should be referenced often to review the overall health of your voice deployment. • Server Performance Report—This report breaks down media quality metrics by server. This is especially important in deployments that utilize separate mediation servers. • Location Report—The Location Report reviews media quality statistics by location defined in Lync Server or by individual users. • Device Report—Similar to the Location Report, the Device Report pivots media quality data by type of device used when a failure is experienced. Although some of the reports might initially seem similar, they all examine the data from a different, unique angle. These reports are critical in proactively monitoring the health of your Lync Server environment. A wise administrator will leverage these reports along with a monitoring platform like Microsoft System Center Operations Manager. The Monitoring role is fairly straightforward; however, there are a few things that commonly go wrong during deployment. This section covers the common issues and areas to check should you find your Monitoring Server deployment not going smoothly. Because a lot of server-to-server connections are involved in a Monitoring Server deployment, the most obvious problem area is in ensuring proper permissions. Also, ensure that usernames and passwords are typed correctly. When in doubt, reenter the usernames and passwords used for database access for the Monitoring Server and the Reporting Server. Also, ensure that the accounts aren’t subject to password expiration in Active Directory. There’s no “doh” feeling like having a service account’s password expire 30 or 90 days into your deployment. If you’ve chosen to use SSL for your Reporting Services URLs, ensure that the subject name (SN) of the certificate matches the site name you’ve chosen. Note that this might or might not be the same as the FQDN of your server, depending on your reporting server configuration. The Lync Server event log is also a good place to check for errors. From the Start menu select Administrative Tools and then Event Viewer. Expand the Applications and Services Logs item and select Lync Server. All events related to Lync Server functions reside here. Often the error description is enough to identify the problem and determine the resolution. The only component needed for Lync Server 2013 Archiving, outside of choosing to add it to all the Front End Servers during the Topology building process, is installation of SQL Server. SQL Server 2008 R2 and SQL Server 2012 are supported for Lync 2013.